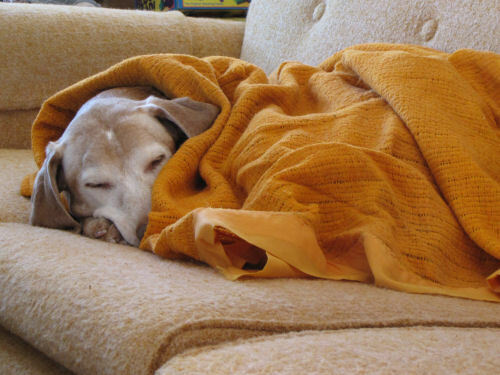 It's one of those days I'm too tired to care. Out doing assignments all day, over 200 miles and 10 cases. Just enjoy the tame rabbits. They followed the owner everywhere he went! I'm a complete sucker for rabbits. These pictures were taken this week, but not all today. I just thought it was interesting to compare the two species. 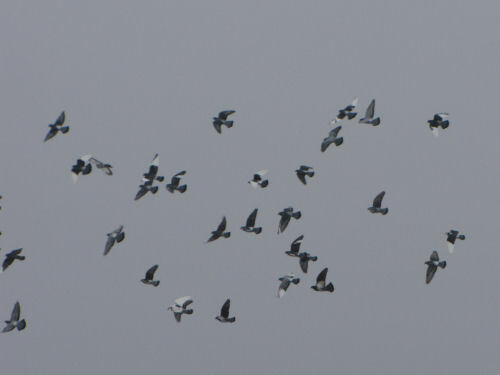 First we have the pigeons from the space station, er... grain elevator. You can't tell all of the difference in still shots. 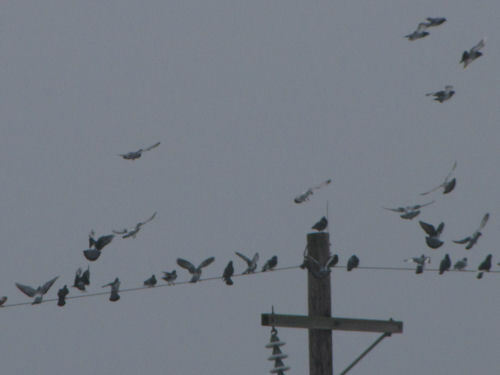 The pigeons fly more slowly, and seem to rise higher, then settle down on a wire, or roof, or whatever. 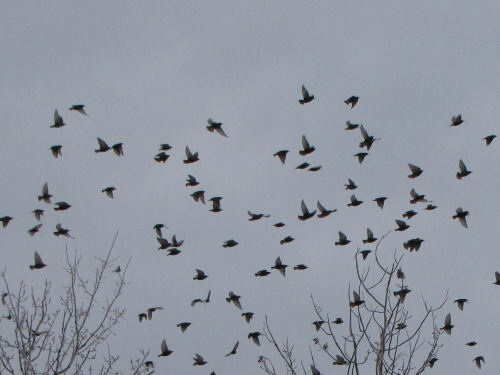 The starlings seem to fly more horizontally. 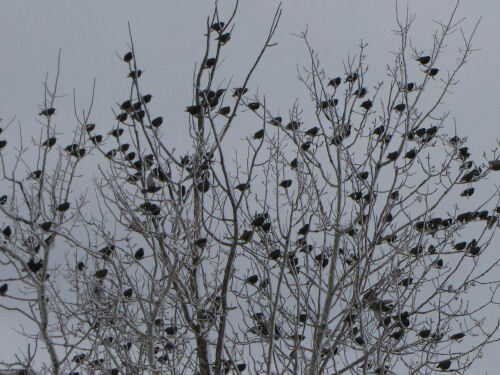 They just zoom across the sky and suddenly they are all in a tree, and then just gone again without ever climbing vertically. I think I need to try to catch video clips! This post is different from most of my others, but it was a really good thing that happened today. If you are reading this and it doesn't make much sense to you, that's ok. Twelve people were baptized this morning at our church. Baptism is just a symbol of a Jesus' death, burial and resurrection that indicates a person wants to be known as a Christian. 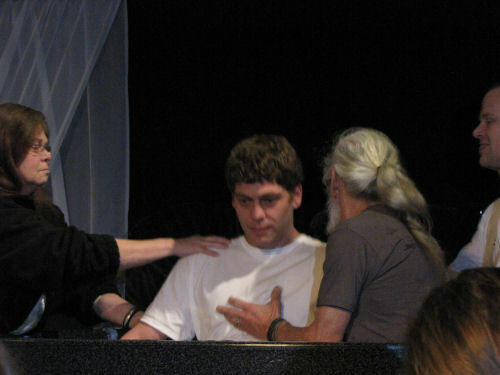 Someone simply lowers the person being baptized under water and then lifts them back up. It's traditionally done with the person going backwards so that they have to demonstrate trust that they will be lifted up. 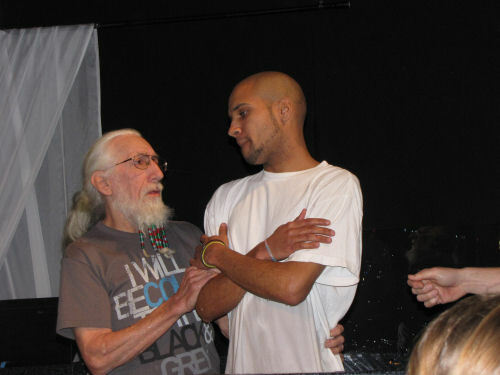 Each person was allowed to choose who they wanted to baptize them, and two of the guys had Omer do that for them. Just a Little Different from Yesterday! 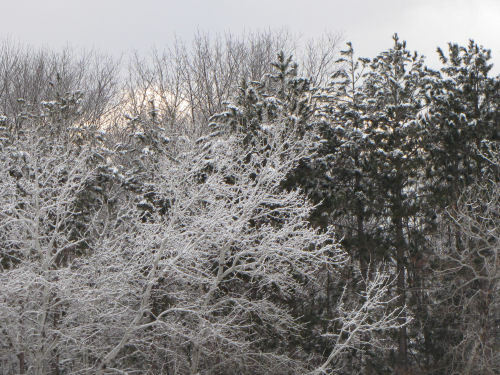 Overnight we had a little bit of freezing rain that changed to "powdered sugar" snow. That made every soft flake stick to every surface. 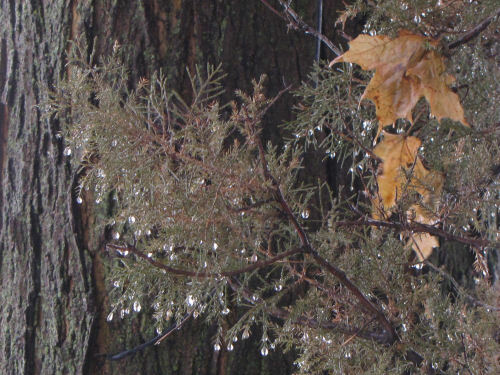 Even though the wind picked up this afternoon, the trees are still coated. These are my two favorite pictures from the day. I did a lot of writing this afternoon and evening... and if you didn't see Joan Young Begins a New Adventure- Writes First Mystery Novel, feel free to take a peek. I was out doing errands this afternoon and we had some lovely sunshine, which always adds magic to any landscape. I drove home via Hawley Road, and just liked some of the trees along the way. 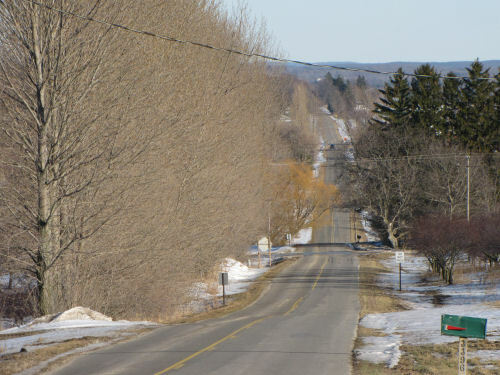 The line of bare gray-brown trees on the left are Lombardy Poplar, Populus nigra. 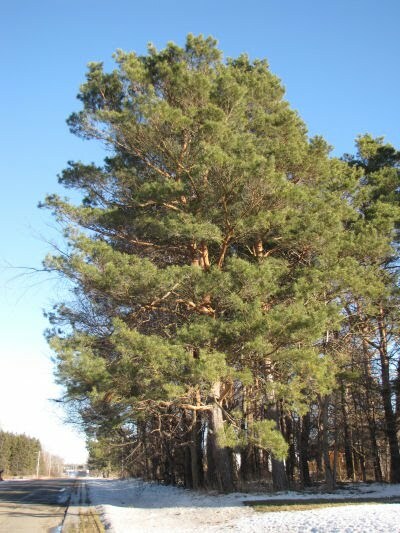 It's a European tree, but is often planted here for windbreaks. If you see a row of tall narrow trees, it might be these. Next, see the yellowish tree just beyond the poplars? 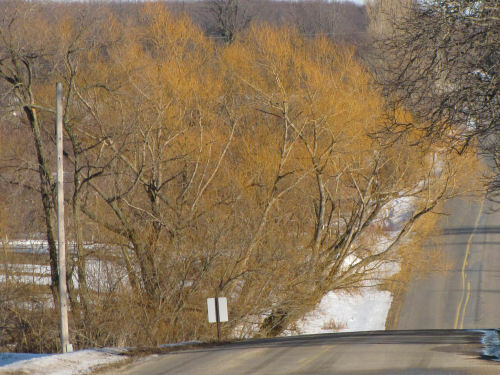 Have you ever noticed that weeping willows seem to look yellow all winter? That can be a clue about this tree. Yes, it's a willow, the black willow, Salix nigra. It's a common native willow, often growing on the edges of wetlands. 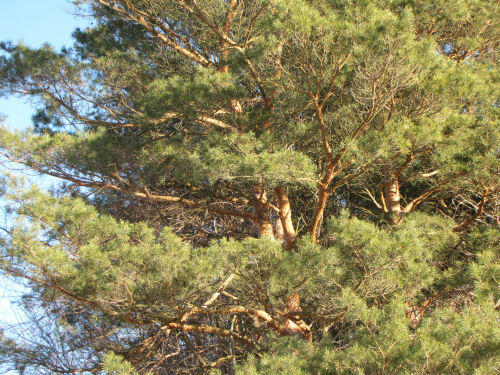 Finally, just a couple of miles farther was a lovely example of a Scotch pine, Pinus sylvestris. Generally, Scotch pine are not on my list of favorite trees. I think they are coarse and scraggly looking when they are young. However, if they manage to survive to this size, they can be interesting. Especially on sunny afternoons. One way to help identify this species is to notice that the outer bark on the upper half of the tree peels off, revealing the reddish underbark. See how the trunk is gray at the bottom and coppery near the top? Here's the upper tree. They also tend to have twisted branches, making the shapes interesting. The gnarly youngsters grow into real characters. This tree is unusually handsome. Even driving and looking at shapes of trees can give me a quality day! 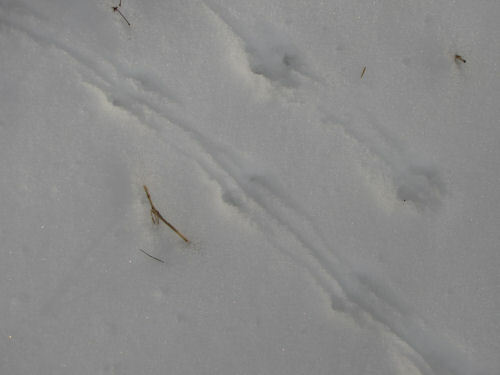 More Small Critter Tracks- Vole? Although I went to Dublin yesterday, I also went out back for a walk with Maggie. It was a calm, warm morning and lots of wildlife had been out. The snow had softened just enough to take good tracks. 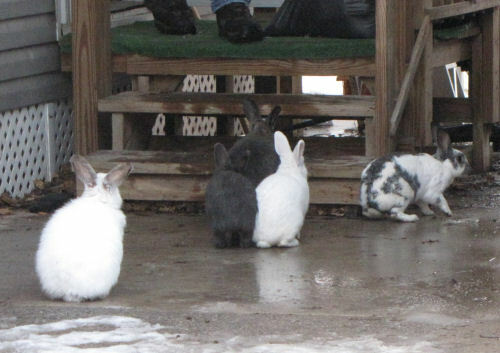 I think we are in a good year for rabbits. There were a huge number of those tracks. That might not be so good for the bushes, but the snow hasn't been so deep that they are really gnawing them yet. Here are some tracks I haven't shown you before, because I haven't found any that were good enough to picture before this. And now that I have them, I have to admit that I'm not positive if they were made by a vole or a deer mouse. But first, here's what they look like. They look a lot like squirrel tracks, don't they? You'd be right if you said yes. This animal also hops when it runs, like the squirrel does. That's what leaves the parallel sets of front and hind feet side by side, and the large hind feet land in front of where the smaller front feet were on the previous "step." 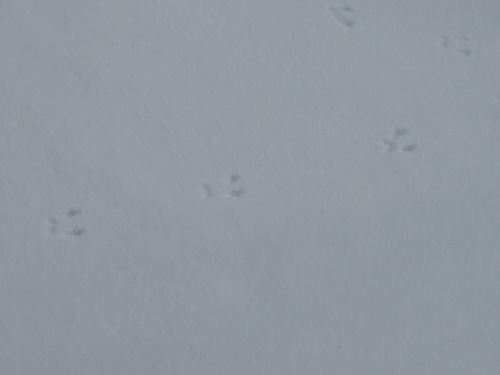 But these tracks are a lot smaller than a squirrel. I managed to break the little ruler I'd been carrying to measure tracks, but I put a glove down for scale. There is about 8 inches between each of those track sets! Also notice that there is no tail mark. Either of these critters are found here in abundance. I'm leaning toward vole because of the width of the track. Voles are slightly larger than mice. But in truth, I'm not good enough to tell for certain. One book says that a deer mouse has four toes on the front feet and five on the back. This was the clearest print I found. Can you tell? I can't. I couldn't resist, since we are on a theme. I've been to Dublin quite often, including today. 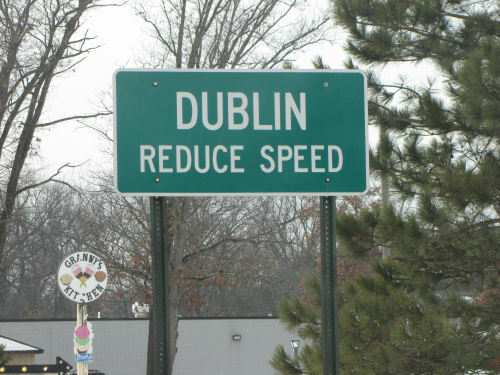 This Dublin, that is. Are you confused yet? 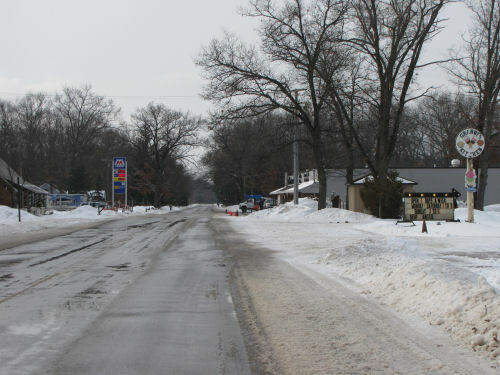 Dublin, Michigan, is in the middle of nowhere, but enough people live surrounding that nowhere to support what has become something of a local phenomenon, and that is Dublin General Store. It's the large building on the right. It has groceries, camping gear, fishing tackle, hardware... everything you would expect of a general store. Also on the right is Granny's Kitchen, a small restaurant that stays open all year. Across the road is a gas station and a summer only fudge shop. That's it, folks. You've just toured Dublin (except for a few houses). If you've been a reader for a while, you know that I'm quite the traveler. I've been to Italy, and recently found Hollywood. But, today, I got to go to somewhere I had never been before. Yes, I went to Paris! I did it all this afternoon! I have superpowers! I speed faster than the Concorde! I am amazing! Oh, ok... 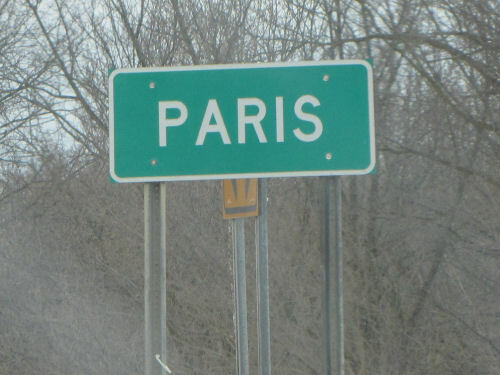 I only went to Paris, Michigan. It's really very cute. That's it... 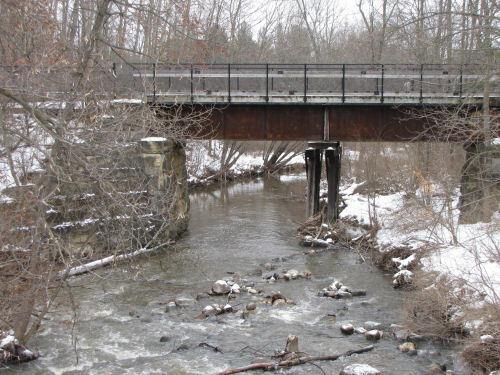 It sits in the valley of Paris Creek trying to hang on to an identity in the face of a railroad's demise and the building of an expressway that bypasses it. 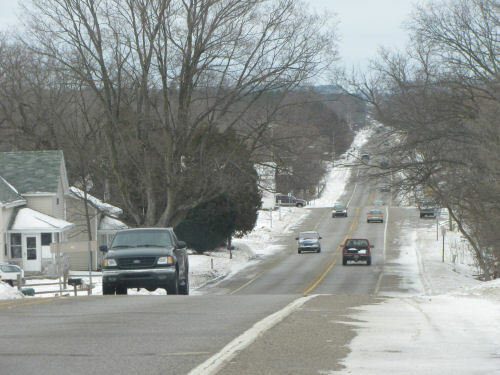 The township hall sign says "Green Charter Township," which means it was the first township to be incorporated in Mecosta County. The largest city is Big Rapids, and that township (Leonard) was apparently organized at about the same time, but Green Township was the first to be approved. Interestingly, the name was originally Parish, for founder John Parish, but was soon corrupted to Paris. How's that for a comedown (or up?). The most interesting thing to me was Paris Creek, a rather large creek at this point. This is pretty much at the mouth of the creek. Just beyond the bend, beyond the bridge, it enters the Muskegon River. And the bridge? It's the old Grand Rapids & Indiana RR line. Now, it's the White Pine Rail Trail, which is the same one that Om and I have ridden sections of. If we keep working our way south from Leroy, where we ended our last ride, we'll get here eventually! Michigan (any state) has interesting place names. Of course, in Michigan you can visit both Paradise and Hell. The Yoopers (residents of the Upper Peninsula) like to point out that Paradise is there, and Hell is... well... in the Lower Peninsula. I've been to both. I've actually been to Hell more often. Is there a message in that? Anyway... today, Paris, tomorrow... who knows? Now we are doing rain. So much for recreational snow. The roads are all icy. I tried to go out on work assignments. More on that later. 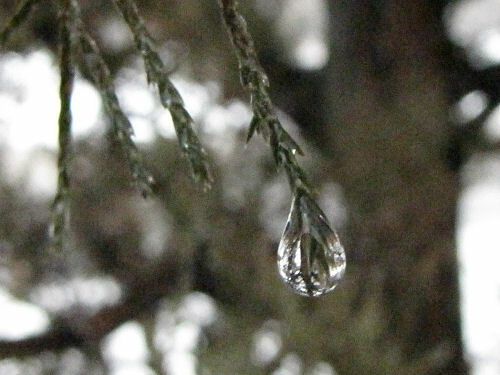 I really liked how the raindrops were clinging to this red cedar. The blessing? Well, um... shuffles feet and gets embarrassed... I slid into a ditch on a back road. I'm fine. I even managed to drive out of the ditch (gotta love my little Subaru!). But I ripped the back bumper off the car. Oops. Or not. Bumpers are only plastic these days and this one had a crack or two. So I get a whole new plastic piece, and the real bumper that's behind it since I also bent one of the brackets, all for the $100 deductible on my insurance. Finally, I'm getting some benefit from having insurance. Mostly I think of it as a legalized scam, but today it earned its keep. Parts are ordered, it will be fixed early next week. The little critters are out! 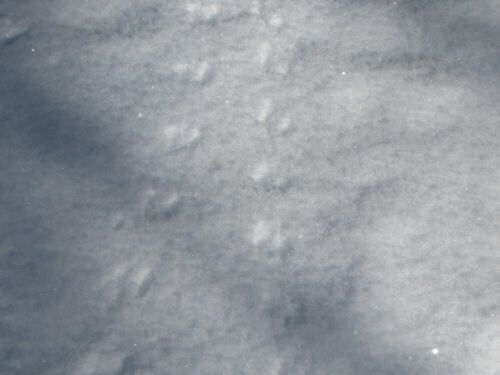 I love the little mouse tracks, and although they tunnel under the snow most of the time, sometimes they run across the top. The first picture is blurry, but it's not the camera's fault. 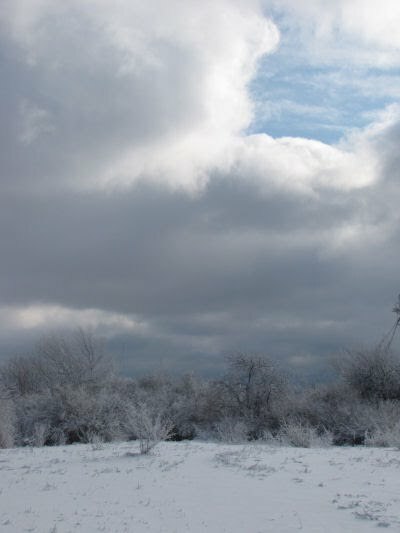 I took it yesterday, and the snow was really fluffy. It didn't hold the pattern well. But you can see that there were two mice, side by side. Today it was warmer, and the snow is beginning to pack a bit so it holds impressions better. Once again, there were two mice side by side. See the side by side prints of the large back feet? 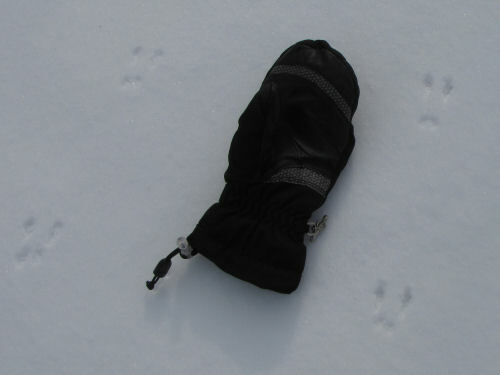 The back feet obliterate the front foot prints when they are hopping through the snow. And I love the cute little tail drag. Where were these mice going? Not far, out in the open! See the two round holes, side by side? They ducked right under the snow where they make tunnels. 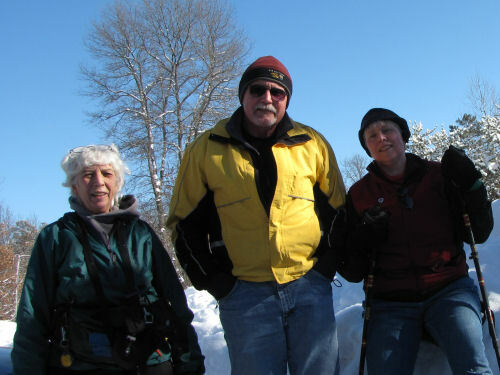 Today was the monthly hike for the Spirit of the Woods trail club. Once again, there were only three of us. But Ellen has become a world traveler, gone to the other side of the globe. This time it was Loren, Dave, and me (with two dogs, Corky and Maggie). The day was pretty cold, but sunny, making everything beautiful. We were all bundled up well enough, so that was no problem. Destination? Pine Valley Pathway. It really looks different in the snow. I was glad someone had been down the trail ahead of us. A few more markers might be in order in unbroken snow. 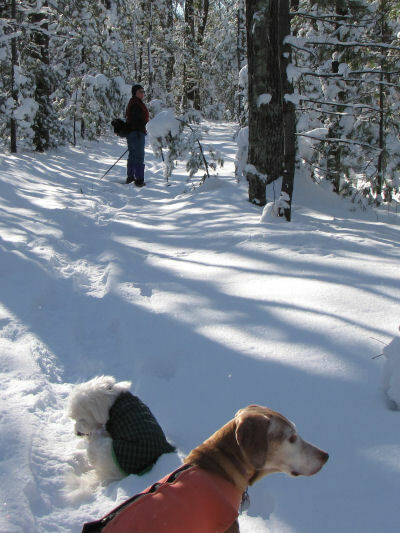 The dogs had enough sense to walk in our tracks, rather than flounder through fresh snow. We went 3.4 miles, which was plenty. Part of the way was well-broken, but another part had only one old ski track to follow, so that was more difficult. It took us just under two hours. And what does one do after a chilly, strenuous hike, and a nice lunch? I'm loving some nice winter! On a blog devoted to finding the positive things in each and every day, is grousing allowed? Most definitely, when it's this kind! 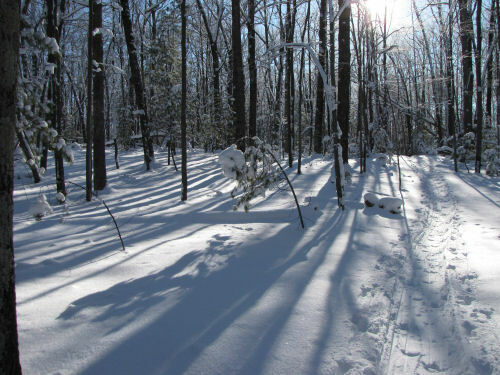 We have a lot more snow than this now, but I took this picture last week along the North Country Trail. There are a lot of different tracks here, but I left them all for scale. 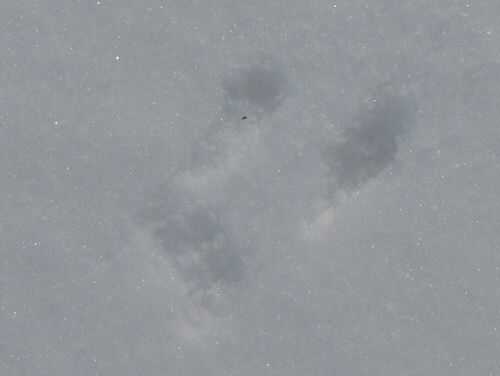 The bird tracks going left to right along the top of the picture are ruffed grouse. 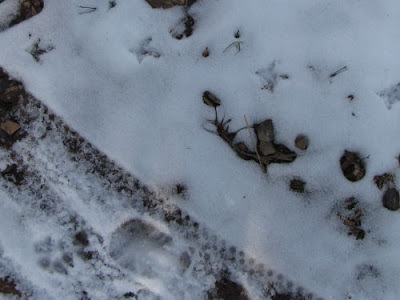 In fact, I saw two of the birds while hiking, but I didn't see these tracks being made, so I had to check in my books after I got home. You can also see one of my footprints, and one of Maggie's. Bicycles are allowed on this section of trail, and two cyclists had ridden through earlier in the day. 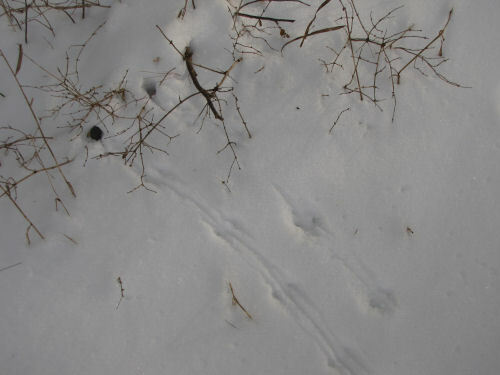 Winter is always a great season for seeing tracks. Who knows what we'll find this year? There's a link below to a post with pictures of the ruffed grouse. I'm going to play along with Chuck's Family Friday "game" today, even though it's Thursday. I won't be doing this very often, but today is a milestone kind of day. 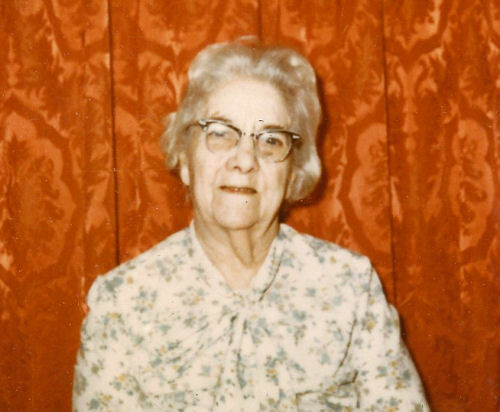 If my grandmother were alive, she would have turned 130 today. Can you believe it? It's true. She was born January 19, 1882. I have too many pictures to share, but it was SO hard to pick just a few. Even so, the ones I chose hardly do justice to the versatility of Emily Marguerite Fisher Rowe. I was looking for the earliest photo we have of her, and I had already scanned this one from 1906, when I found a portrait from 1900. But I kept this one, because it has more interest, I think. Granny, Emily, was the oldest of four children, and the only girl. 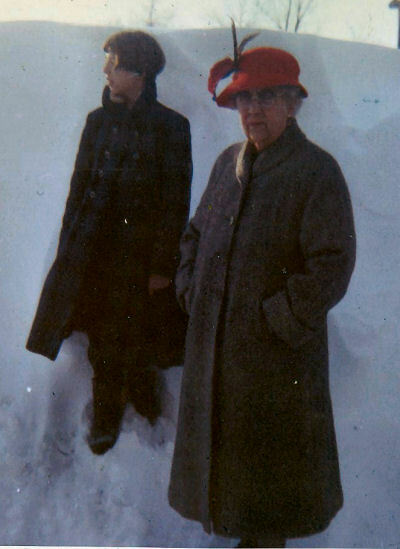 She was born in Spencer, New York, to Charles and Catherine Fisher, and her brothers were Lou, Ben, and Charlie. Although she was the oldest, I never knew any of her brothers (we did receive a couple of pictures from Ben when I was about ten). 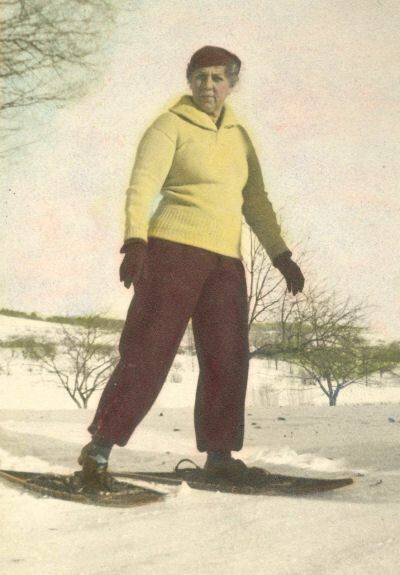 She was always athletic. Tales abound of her beating the boys at goat cart races, or climbing trees (usually with a book to read). 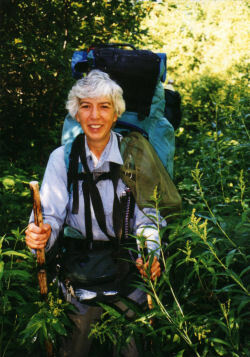 There are photos of her climbing mountains in the Adirondacks, rowing a boat, camping, and playing tennis in bloomers. 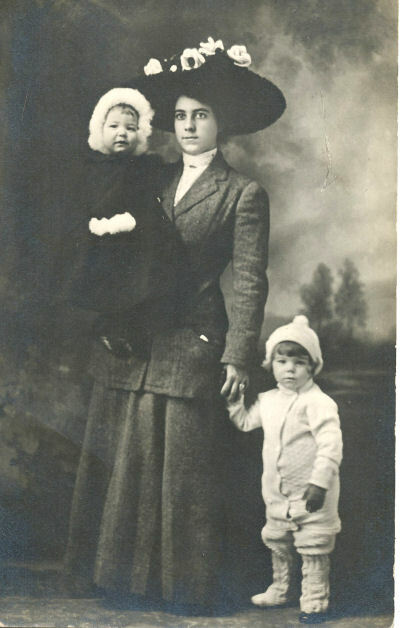 In 1906 she married Howard Meade Rowe, and Merrill Fisher Rowe (called Jacques- "Jack") was born in 1907, and my mother, Catherine Burnham Rowe, was born in 1909. Pictures of Jacques and me at similar ages, side by side, are indistinguishable except for the age of the photo. There was another daughter, Margaret Perham Rowe, born in 1913, who was a preemie and only lived three hours. Jacques was killed in a tragic accident when he was 26. Of course that was long before I was around, but Granny never really got over it, and Jacques was always a "presence," especially since I looked so much like him. Granny was forever interested in many things. She gave public "readings," as they were called in the early 1900's. Most were sentimental or religious essays or poems, staged quite dramatically. She also gave lectures about quilts and quilting. There are scrapbooks of clippings about many of her performances/talks. She was an avid knitter, and taught me to knit when I was four. She had slowed down a lot by the time I appeared in 1948. This picture is the two of us in 1960. I've always just liked this one too. It's very typical Granny, and I look less dorky than I usually did during that period of life. This is definitely the last picture that was taken, on her 89th birthday, about 17 months before she died. I have to say with all honesty that our family was quite dysfunctional, probably because we were all very strong personalities, also with strong flaws. Granny was an amazing person, however, and if I could have known her as an adult rather than a child, I would have been able to better understand some of the reasons she was the way she was. I do think that people who lived in her generation had to make huge mental leaps at the changes in the "world." 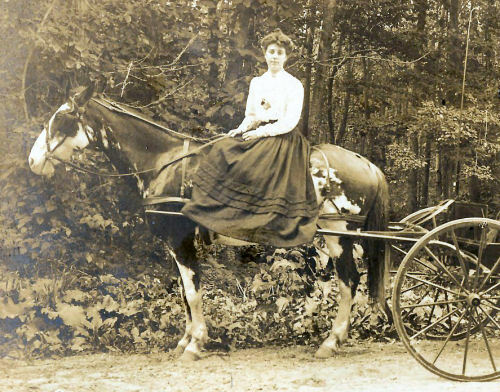 When she was a child the primary transportation was still horse and buggy, and before she died we put a man on the moon. I'm not sure that even the transition to the digital age can compete with that scope of technological change. Anyway... that's my Granny. Happy Birthday.